President Donald Trump sat with South Korean President Moon Jae-in at the White House on Tuesday as he told the press he was not happy with how trade talks with China have gone. “They’re a start,” Trump said of the talks thus far, responding to a question from a reporter. Trump called it a “dereliction of duty” that United States representatives have allowed many countries, China being the “big one,” to take advantage of the U.S. on trade. He also expressed disappointment in a second meeting between North Korean dictator Kim Jong-un and Xi after which Trump perceived a change and “different attitude” from the “North Korean folks” after Kim left China the second time. He said the second visit came as a surprise. A top-tier U.S. trade delegation traveled to Beijing in early May to negotiate trade with China. Treasury Secretary Steve Mnuchin led the U.S. delegation that included Commerce Secretary Wilbur Ross, U.S. Trade Representative Robert Lighthizer, Assistant to the President for Economic Policy Larry Kudlow, and Assistant to the President for Trade and Manufacturing Policy Peter Navarro. The talks continued two weeks later in Washington, DC, but not all of the U.S. trade officials from the Beijing talks were involved in each portion of the D.C. talks. Chinese Vice Premier Liu He met with the U.S. delegation in China and led the special envoy of President Xi to D.C. 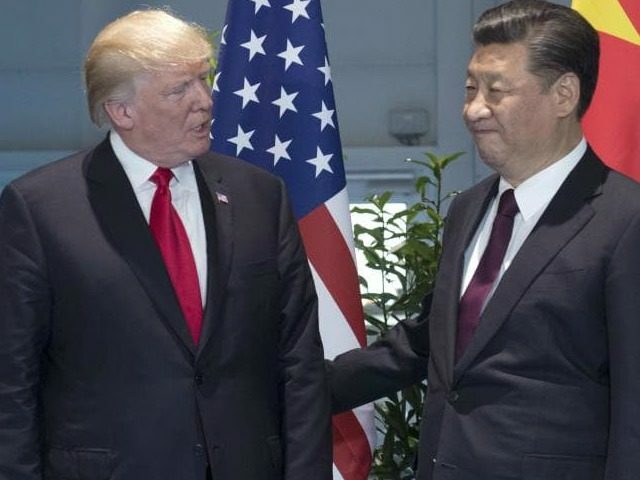 The D.C.-based talks resulted in an agreement between the two nations with “effective measures to substantially reduce the United States trade deficit in goods with China,” according to a joint statement released after that stage of the talks concluded. China has agreed to cut tariffs on U.S. auto imports, and the U.S. has agreed to hold off on potential additional tariffs of $150 billion on Chinese imports to the U.S. Among the paramount concerns of the U.S. have been its trade deficit with China and the theft of U.S. intellectual property in China. Kudlow has warned that the process of working out trade issues with China will be a “lengthy” one. In the joint U.S.-China statement released last Saturday after the D.C.-based talks, the two countries agreed to the importance of intellectual property protections and to “strengthen cooperation.” China broadly agreed to “advance relevant amendments to its laws and regulations in this area, including the Patent Law.” However, the U.S. will now send a delegation back to China to work out the details of reducing the U.S. trade deficit with China and likely other details on trade as well. It is not yet clear which U.S. officials will be included in the next trade delegation to China.